I recently had a conversation with Steve Sargent, proprietor of Analecta Books, where he specializes in selling signed first edition and limited edition books. Analecta also sells “bespoke” remarqued books, where he commissions the artist to embellish the book with a drawing – something very unusual in the bookselling world. Tell us a little about Analecta Books. Analecta Books is a small and “intimate” little outfit — basically, it’s just me, and when required, my wife and daughter who will help out with the packing when things get busy, especially around Christmas. That’s the worst thing about bookselling — all that bubblewrap, boxes, and tape! People sometimes ask me where the word “Analecta” comes from — I came across it a long time back, and looked it up. It said “Literary gleanings,” and comes from Confucious’ “The Analects.” For some reason, that always stuck with me, and seemed appropriate when I started to sell books to subsidise my own voracious collecting. Analecta Books is run from home, in my spare time (what little there is of it). Books are pretty much my only vice, so my wife is very understanding of it, and puts up with a lot (although she often complains of the fact that there are books in every room!). How did you come to specialize in bespoke signed, limited edition and remarqued books? We have been selling books for over ten years now, and the nature of our books has evolved into a distinctive differentiation of the general offering out there. We started out selling run-of-the mill signed first editions, but the nature of collecting is such that a collector will always want something unique, something that no-one else has. So I sat and thought about ways to deliver that. Having an author date a book (publication-dating is preferred, if possible) adds value, and often helps to indicate that the book itself has been in the hands of the author. Collectors do prefer this, knowing that the book has been handled by an author, rather than been signed via a “tipped-in sheet” (this is a special page that has been mailed to the author, signed, then mailed back for binding into the final book). The concept of “lining” a book (i.e., having the author hand-write a quote from the book) with the signature/date, again, sets the book apart from the norm. Offering first editions treated in this way has proven very popular, and as I only handle around half-a-dozen copies of a given title, relatively unique. I’m not the only bookseller offering SLD copies, of course, but I am unaware of any others out there selling remarqued copies. What is a remarqued book? Remarques? Well, in the true sense of the word, they are small drawings on a larger work — usually something that artists may do by hand, on perhaps a print. I read somewhere that Whistler used to do this (with a butterfly device) on prints of his works. I’ve just carried this principle into the world of books, whereby I will get the cover or interior artists (sometimes both, where they are different!) to sign and remarque the book. To be honest, many of the “remarques” I have commissioned go beyond that, and are full-blown sketches that may fill a whole page. The detail can be quite incredible. In some instances, the author and artist may be the same — one particularly talented example is Ali Shaw, who signed, lined, dated and remarqued his debut fantasy “The Girl With Glass Feet” — they were extremely popular with collectors. What is the process of getting a book remarqued? Is this done on a book before the buyer sees it, or is this something that’s typically done later on, on an individual basis? They are always done beforehand. To be honest, the artists will fit this kind of thing in around their other commissions, and if they are up against deadlines, the books will wait ‘til they can fit them in. Also, you never can tell what you’ll get back — many artists work on computers these days, and amazing though the output may be, you’d be surprised at how many artists can’t do an awful lot free-hand. I won’t leave anything to chance, and so have to have the books back in order to see what we have. As I have touched on though, we’re talking small batches here, and many of the remarques will be unique (possibly variations of the cover art, for example, but nevertheless, unique). Vincent Chong as an award-winning fantasy artist who is fantastic at both approaches, whereas Ed Miller (another hugely popular award-winning artist) prefers to work on canvas and board, the old-fashioned way. Some of the best remarqued books I have seen have come from these two guys. Signed books are a popular area of collecting. But there’s some controversy about it. 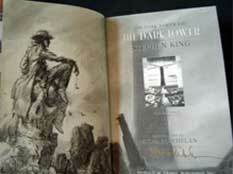 Some collectors prefer that books be simply signed, without any inscription. Others believe that the more the author has written in addition to his signature – whether it be an inscription, a date, or a few lines – the better. What do you think? Actually, I think I am easy either way, but in trying to provide a tailored and differentiated service, I aim to please both camps. Some authors too, don’t line their books (it’s probably a big ask, actually, at public signing events, where they may have to sign a couple of hundred books). In the same way, many people like their books to be dedicated to them personally — unless specifically request (usually by my daughter) I try to avoid this, even in my own copies. It’s not that I am against it as such, but when I’m gone, I would like to think I am leaving something of more than sentimental value behind — and it is so much harder to sell a book dedicated to Joe Bloggs on the secondary market (unless of course, the buyer’s name too, is coincidentally, Joe Bloggs). Again, there are exceptions to this (a book dedicated by Dr Livingstone to Stanley, for example), but as a rule, I think this holds true. When selling signed books, how do you go about determining if a signature is legitimate? Some people have signatures which vary somewhat; is that ever an issue? I never source from the secondary market — I got my fingers burnt with one bookseller in America who claimed to be personal friends with Joe Hill (Stephen King’s son, and a successful author in his own right) who was offering signed, lined, dated and numbered copies of the hardback edition of “20th Century Ghosts .” They all turned out to be forgeries, and it got very messy. It came to light when a friend of mine took one to one of Joe’s open signings, where he denounced it, and personally vilified the seller on his blog. In my view, it’s stupid to try and get away with this kind of thing, it’ll just ruin your business once word gets around (and trust me, it will). I personally guarantee all my books, and so I always source from open events, from the publishers, or from the authors/artists directly — I never source from the secondary market. Some authors’ signatures do vary, and for different reasons. Take Jeffery Deaver’s signature on “Carte Blanche” (the new James Bond book) — the trade edition that he signed several thousand copies of at the publisher’s warehouse is markedly different from that which he used at his open events, but that’s what happens when you sign a couple of thousand at a time. I’ll bet his first and last autograph from that stock signing looked like those of different people. Terry Pratchett, on the other hand — over the years, his signature has change significantly and now (due to his ill health, probably) his signature is very different from early exemplars. Of late, he has taken to using a rubber stamp — I’m not sure how well-received that will be by collectors. What exactly are bespoke books, and why are they collectible? “Bespoke” is a tailoring term — Saville Row tailors offer a bespoke “made-to-measure” service, rather than off-the-rack. And that’s basically what I’m doing here, although I tend to identify the books and sort the logistics of the “tailoring,” in the hope that my book-buying audience will agree. I have had suggestions of candidate books, and am always willing to look into them, where practicable. And it’s their uniqueness, that makes them truly collectable. What is the allure of limited edition books? What makes them different from the trade edition? Again, it’s the warm glow associated with having a “special” copy that very few others have. Plus, let’s face it, Limited Editions are often made to far higher production standards than the trade editions. For example, a heavier paper Smyth-sewn binding, slipcases, additional content, etc. Subterranean Press in the US is fantastic at this. Sometimes though, producing these editions can prove very expensive. Few were better at publishing Limited Editions as Hill House, whose production standards were so high, they became prohibitively expensive, and sadly the House went bust. If you can pick up a Hill House edition via ABEBooks.com (for example) you’ll own something pretty special. Are you a collector as well as a seller? Is it tempting to keep some of the very special books for your own collection? Yes, I am a collector — that’s how this whole thing started, you’ll remember. And as I primarily go for books that suit my own tastes (except where I have suggestions from a customer), it’s a given that I will almost always hold back one copy. I have more books now than I can shake a stick at (I tried it once, just couldn’t shake it). I would probably be guessing here, but around five or six thousand books is probably near the mark. It’s an expensive hobby, though. I once went to Hay-on-Wye with my wife, and saw a beautiful leather-bound copy of Wilkie Collins’ “The Woman in White” (one of my all-time-favourite books). It ate at me for weeks, not owning it, and eventually I caved in and paid the £1,250.00 asking price. I then had to wait for the right time to tell my wife what I had done. Of course that time never quite came, and I was undone when my wife rang the store a couple of months later, to buy it for me for Christmas! But a book like that will always hold its value, and when my wife (bless her) hankered after a new wooden floor, I parted with it in order to give her what she wanted. I sold it back to the same shop, who gave me what I paid, so presumably he could sell it on for more. It is with no small measure of self-pity though, that I see copies going now for £5,000 and more (chiefly thanks to the success of the Lloyd-Webber musical, I think). What would be your advice to someone who would like to begin a collection of signed, limited edition, or remarqued books? My advice would be to research the book, and the seller, before you make any purchase. Especially if buying from eBay, where anyone could be selling anything. Yes, there are bargains to be had, but there are unscrupulous sellers there, as well as scrupulous. Check out their feedback, and look for those sellers on other sites, like Abe. Most will often have their own sites, if they know what they are doing, and not just looking for an opportunistic profit on a one-off book they know little about. Also, research prices, and stick within your budget. Don’t be afraid to haggle a bit, either — most booksellers will come down five or ten percent. Specialise — build a collection in an area you know about and enjoy. It may be by a specific author or genre, or maybe you’ll want to collect Booker shortlisted authors. This (in my view) gives more pleasure than just a random selection of books that you may not really care for, let alone read. And finally (and this may be controversial) — don’t be afraid to read them. Some collectors, of course, will buy a reading copy (usually a paperback) and that’s fine, but if you’d rather put all your limited funds into buying the collectible editions, don’t forget, books are meant to be read. Read them carefully, but read them. Thanks so much for your time, Steve. It’s been fascinating to learn more about this area of collecting. For more information visit Analecta Books.